For over 15 years Growing Hope has hosted a Farmers Market in Downtown Ypsilanti on Tuesdays. This market has become a staple in our community and is vital to the residents it serves. In 2015 we relocated and began work on the Robert C. Barnes Sr. Ypsilanti Farmers MarketPlace, a year-round, indoor-outdoor, space to house this market. The market is outdoors weekly May through October, and indoors January through April on the second and fourth Tuesday of the month. 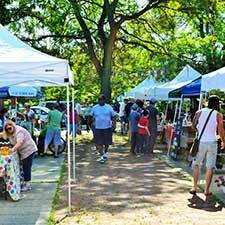 Since 2013 Growing Hope has managed and continued to fund the beloved and historic Depot Town Farmers Market in Ypsilanti on Saturdays. Join us for our 2019 season opening day on Saturday, May 4th! Home Vegetable Garden Program Applications Open!